This past week I received a newsletter from a notable physician of Ayurveda that frequently travels from his home in India, to share his knowledge of Ayurveda to the world. I have met and worked with this fellow, and respect both his knowledge and experience in the field of Ayurveda. In his newsletter I noticed a post on the subject of vitamin B12, and it caught my eye, because I have long been aware that India has a very high rate of vitamin B12 deficiency. Much to my disappointment, however, the post was little more than a collection of mistruths about vegetarian sources of vitamin B12, and a diatribe against non-vegetarian practices. Needless to say, I was both disappointed and a little disturbed that a respected physician could write such a biased piece, particularly when trying to promote himself to a global audience. But in truth I am not surprised, because his perspective is all too prevalent among physicians in India these days, who have chosen to forfeit the integrity of Ayurveda in favor of political correctness. Can Vitamin B12 be found in plants? In his newsletter, this physician claimed that Vitamin B12 could be easily obtained from plant sources, and cited examples including plant foods such as moringa (drumstick), papaya, barley, walnut, and wheat germ. The assertion that Vitamin B12 can be obtained from plants is one that I have seen made many times over the years, typically spoken by neophyte or otherwise uneducated vegetarians and vegans. The original source of this assertion isn’t important, as it has now become a meme within the vegetarian community. What is more important is to understand that this notion is dead wrong. As wonderful as it is, Moringa fruit does not contain vitamin B12. The reason why plants do not contain vitamin B12 is because the ability to synthesize it is only found in bacteria and certain genera within the archaea. Despite its limited production within these microorganisms, vitamin B12 remains an essential nutrient for all animals, and the only way for this vital nutrient to move up and through the food web is if one animal eats another. It may come as a surprise to learn that even ‘vegetarian’ animals such as cows are thus also insectivores, consuming a significant volume of insects with each mouthful of fresh green grass they take. And lucky for the cows, who need vitamin B12 just as much as we do, many insects happen to be a good dietary source (for B12, as well as other nutrients). In the human diet, vitamin B12 is only found in any significant quantity within animal foods. For vegetarians, this includes dairy products, as well as eggs (if they eat them), but neither of these foods contain particularly high quantities. This is why it is fundamentally important that these foods remain an important part of vegetarian dietary practices. For example, swiss cheese is among the highest vegetarian sources of vitamin B12 at about 3.3μg per 100 gram serving, whereas something like cooked clams contains almost 100μg per serving. Likewise, other seafoods and organs meats such as liver contain significantly high quantities of vitamin B12, meaning that it is a lot easier to maintain optimal vitamin B12 levels when eating a non-vegetarian diet. Vitamin B12 is a crucial nutrient that functions as a cofactor in two important enzymes, one of which is methionine synthase. This enzyme functions to transfer a methyl group from 5-methyltetrahydrofolate (5-THF) to homocysteine, regenerating tetrahydrofolate (THF) and also methionine in the process. THF is one the active forms of folic acid in the body, and plays a key role in many reactions, particularly in the metabolism of amino acids and nucleic acids. Methionine is an essential sulfur-based amino acid that also plays a number of key roles in the body including the synthesis of S-adenosyl-methionine (SAMe), required for the synthesis of the myelin sheath that protects the nervous system. A deficiency of vitamin B12 thus creates a functional folic acid deficiency, and impairs the synthesis of S-adenosyl-methionine (SAMe), leading to widespread neurological damage. A deficiency of vitamin B12 also impairs the regeneration methionine from homocysteine, resulting in the accumulation of homocysteine, which is a significant risk factor in the development of a wide range of diseases, including thrombosis, psychiatric illness, fractures, cardiovascular disease, and kidney disease. Many infants and new mothers in India are at significant risk of vitamin B12 deficiency. If you are a vegetarian and have any of these symptoms, even in a mild form, please make sure that you’re taking sufficient amounts of vitamin B12 and folic acid. Why is vitamin B12 deficiency so prevalent in India? Whether vegetarian by choice or through poverty, the reason why so many people in India suffer from a vitamin B12 deficiency is because most do not consume a sufficient volume of animal products in their diet on a daily basis. For many Indians, the every day diet consists primarily of a cereal grain such as rice or wheat, eaten with pulses such as chana, mung, urad, and toor. 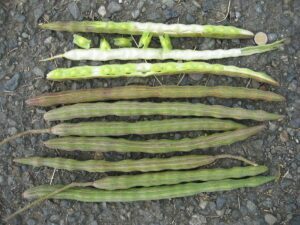 In previous generations, these grains and legumes were processed and only partially refined, leaving on some of the outer hull and thereby increasing the fiber content. In modern India, however, all these cereals and legumes are now for the most part industrially refined and thus stripped of this extra fiber. While this fiber itself does not contain vitamin B12, ensuring that we have adequate fiber in the diet means that we can at least produce a tiny bit from the bacterial synthesis that occurs in our colon. To be sure, feeding the gut bacteria this extra fiber isn’t enough to maintain vitamin B12 levels alone, but when your diet puts you at risk of deficiency, every little bit helps. The dhenki is traditionally used in Indian villages to partially mill cereals such as rice. Consuming this extra fiber, however, creates problems that aren’t on the radar of most nutritional experts who recommend a high-fiber diet. All seeds, including grains or legumes, contain a variety of plant toxins that are synthesized by the plant to discourage predation. Some of these ‘toxins’ induce inflammatory or hypersensitivity reactions, whereas others function as anti-nutritient factors, such as protease-inhibitors that impair gastric function. In the case of the latter, impaired gastric function can play havoc with vitamin B12 absorption, which occurs in the upper digestive tract, after it is attached to a glycoprotein called intrinsic factor that is released by the parietal cells found in the gastric mucosa. In traditional Indian cuisine, many grains and cereals were fermented before preparation, such as sourdough roti, or the steamed fermented rice cakes called ‘idli’ that are common in south India. That sad truth of it, however, is that a few generations of Indians raised on refined cereals and legumes means that most people have pretty much forgotten traditional methods of food preparation. In a casual survey of Indian physicians I know, very few fully appreciate just how dramatically the modern Indian diet has been altered from its traditional forebear, with its excess of refined sugar, refined cereals, and refined oils. And unfortunately, even fewer actually know what to do about it. I think that as physicians, practitioners and healers, we all have a responsibility to maintain the authenticity of whatever tradition we uphold. Oftentimes this means that we need to leave our personal and religious beliefs at the door. With regard to Ayurveda, it means that we need to fully comprehend the entire scope and practice as described in the ancient shastras, and not apply a partial perspective that ignores the whole. Likewise, this same responsibility applies in order to correctly represent whatever perspective we lay claim to. To be sure, the ancient Indians knew nothing about vitamin B12, but if we follow the classical teaching on diet, which includes both plant and animal foods, we probably don’t even need to consider it. But if we wish to bend Ayurveda to our biased perspective and use science in our defense, it is equally important that we get the science right. In my next blog post, I will address the philosophical underpinnings of the assertion that Ayurveda is a vegetarian system, and in particular, the confusion around the terms ‘sattva’, ‘rajas’, and ‘tamas’. Excellent post Todd. I love it that you give the chemistry behind the logic. What’s your take on supplements? Any recommendations in that area? I don’t generally recommend many supplements, as my emphasis is upon a whole food diet. Nonetheless, in long-standing deficiencies, in chronic disease, or cases in which the diet is limited, supplements can play a helpful role. For vegetarians, I do suggest vitamin B12 and vitamin D3, and vitamin D3 in most of the population in temperature/northern latitudes, from Sept through to April. Other common supplements I prescribe include magnesium, probiotics, B-vitamins, and essential fatty acids. Personally, I do not take any supplements, and nor do I think they are necessary when eating a proper diet. I was a long time vegetarian, then last year I began the Ketogen life, and almost naturally went back to eat meat (mostly poultry, and their livers), because it’s too difficult to be a vegetarian ketogen …I make both lemon and milk kephir, they are great! I studied a long time ago ayurveda, but I think the food now, like the milk, is not the same as the time of ayurveda , and we should review it with there new scientific recoveries in nutrition.